Greetings from The 88 Project! We are bringing you news, analysis, and actions regarding human rights and civil society in Vietnam during the week of October 1-7. In a short and secretive trial this week, five activists were sentenced to a combined 57 years in prison. International organizations condemned the charges against the five, who were loosely affiliated with a pro-democracy civil society group. Next week, citizen journalist Do Cong Duong, who was arrested for filming a forced eviction, will go to trial on a second set of charges, and environmental and pro-democracy activist Le Dinh Luong will appeal his 20-year sentence. Three members of a constitutional rights group have now been formally charged and await trial; six others have been detained. Police have also arrested a female activist in Ho Chi Minh City, Hoang Thi Thu Vang, who has participated in online activism and public protests. After a recent visit in prison, student leader Phan Kim Khanh’s father reported that he is in good health but is filing a complaint over an appeal issue. This week, we remember the Venerable Thich Quang Do, who has been under house arrest since October 2003, and retired teacher Dao Quang Thuc, who was arrested one year ago and was recently sentenced to 14 years in prison for peacefully expressing his views. Several residents were temporarily detained last week after protesting toll fees in Dong Thap province, and a relative of detained US citizen Michael Nguyen has come forward after she was attacked following a visit to Nguyen in September. In the news, read about dissident singer Mai Khoi and her views on Facebook’s role in the crackdown on free expression in Vietnam. Please support us in our last two weeks of our crowdfunding campaign to create interviews with Vietnamese female activists and former political prisoners. See a preview of the interview series, here! Luu Van Vinh was sentenced to 15 years in prison on October 5. 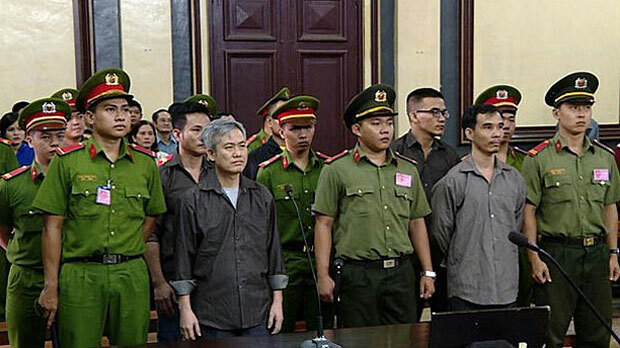 His co-defendants were also sentenced to prison terms: Nguyen Quoc Hoan, 13 years; Nguyen Van Duc Do, 11 years; Tu Cong Nghia, 10 years; and Phan Van Trung, 8 years. The five had been detained since November 2016, and all were charged under Article 79 of the 1999 Criminal Code for subversion. Vinh and his friend Do had both protested Chinese activity in the South China Sea and the toxic Formosa spill that began in April 2016. Vinh founded a group called the Coalition for Self-Determination for the Vietnamese People, which he had left a few days before his arrest; others were implicated as allegedly belonging to the group, which called for political change in Vietnam. “Thirteen people have been placed behind bars in the past five weeks for ‘crimes’ such as blogging, using Facebook and other peaceful pursuits,” Amnesty International said in response to the trial. Human Rights Watch called for their release as well. Facebooker Nhi Nguyen and her husband, Pham Ngoc An, were arrested at 7:30 AM when they came to attend the trial in support of their uncle, Nguyen Van Duc Do. In the first instance court hearing on September 17, land rights activist Do Cong Duong was sentenced to four years in prison on the charge of “disturbing public order” under Article 318 of the 2015 Criminal Code. Now, on October 12, 2018, the People’s Court of Bac Ninh province will hold another trial against him for charges of “abusing democratic freedoms” under Article 331 of the 2015 Criminal Code. Environmental and pro-democracy activist Le Dinh Luong will face an appeal trial on October 18. Luong was tried on August 16 in Nghe An province and sentenced to an astounding 20 years in prison. A veteran, Luong was sentenced under charges of subversion for peacefully advocating for a clean environment and multi-party democracy. After the trial, news surfaced that journalist Nguyen Van Hoa was beaten and forced into giving testimony used against Le Dinh Luong in court. Both activists had been involved with helping victims seek justice after the 2016 Formosa environmental disaster. Ngo Van Dung (Facebooker Biển Mặn)’s family received an announcement about his temporary detention and prosecution, after his location and status were previously unknown for many days. He was prosecuted by Ho Chi Minh city’s Investigation Security Agency and Police under Article 118 of 2015 Criminal Code for “disturbing security” and is now detained at a temporary detention house by the Investigation Security Agency of the Ho Chi Minh City police, where he will await trial. He is a member of the civil society group Hien Phap, which has been targeted in recent weeks by police. Other activists have also been formally charged in connection with the group, which aims to teach Vietnamese citizens about their Constitutional rights. Member Ho Dinh Cuong (Facebook user Văn Cương Hồ) has officially been charged with “disruption of security” under Article 118 of the 2015 Criminal Code. Huynh Truong Ca was arrested on September 4 and is now possibly being charged with “making, storing, spreading information, materials, items for the purpose of opposing the State of the Socialist Republic of Vietnam” under Article 117. Ho Chi Minh city’s police have arrested nine members in total, with the intention to investigate for them criminal prosecution. Beginning on September 1, police secretly began to detain the group’s members and withheld information about their detentions from their families. The group had planned to promote peaceful demonstrations in early September. In an unrelated case, female activist Hoang Thi Thu Vang (Facebook name Hoàng Thu Vang) has also been arrested and charged with “disruption of security” under Article 118 of the 2015 Criminal Code. She is believed to have been arrested on September 3 in Ho Chi Minh City. She has posted online commentary, advocated for enhanced food safety in the country, and participated in national demonstrations in June. On September 30, Phan Kim Khanh’s father visited him at Nam Ha detention center in Ha Nam province. Khanh’s health and spirit are good. However, he asked his father to contact his lawyer with an appeal issue. He wants to file a complaint towards detention center of Thai Nguyen province for refusing to transfer his appeal petition, which was written and sent right after the first instance court hearing on October 25, 2017. This October, we remember the Venerable Thich Quang Do, the Patriarch of the banned Unified Buddhist Church of Viet Nam (UBCV), who has been confined to the Thanh Minh Zen monastery in Hồ Chí Minh City since October 2003. According to the US Commission on International Religious Freedom, “In 2018, Thich Quang Do will turn 90. Despite the Patriarch’s age and declining health, Vietnamese authorities continue to surveil the monastery, enforce his confinement, and consistently deny him access to medical care.” He is a leading advocate of religious freedom, human rights and democracy and has been alternatively imprisoned, internally exiled, or under house arrest since 1977. On September 29, police at Cao Lanh District, Dong Thap province temporarily detained five residents protesting a toll at Cai Nho river bridge, Cao Lanh District. They all were accused of “conducting public disorder.” The five detainees are: Phạm Hoàng Quy, 35, Trần Thanh Tùng, 30, Phạm Anh Vũ, 19, Trần Thiện Thắng, 40, and his wife, Nguyễn Thị Thanh Tuyền, 29. According to the police agency, many people and drivers gathered at the Cai Nho toll station to protest against the toll charges in the evening of September 29. At that time, Mr. Thang with his wife, Tuyen, stopped their 15-ton trucks right at the toll station without moving. Many people took advantage of this situation to protest and shout in the area, and the police then came and arrested them. Undercover police agents attacked a relative of Michael Nguyen, a US citizen of Vietnamese descent, who is currently in pre-trial detention in Vietnam, without formal charges. The attack occurred on September 6 after the relative visited Nguyen in the detention facility. Upon leaving, she was followed by motorbikes, kicked, and forced off of her bike. The woman’s leg was broken. She was so rattled by the incident that she kept it secret for nearly a month. Can Thi Theu was arrested for a second time in 2016, for a nonviolent demonstration against land grabs in Duong Noi, in which fertile land is confiscated by the government, usually for industrial use and without proper compensation. Support women like Theu with a donation to our crowdfunding campaign! With the funds, we will create an interview series with the female activists, sharing details about their backgrounds, personal lives, and motivations for becoming human rights advocates. Donate to the campaign here, and check out the interview series’ preview clip with female activist and former political prisoner Pham Thanh Nghien.